their names, department and college affiliations, and contact information. Enter your GatorLink username and password. Your password can be changed at mvUFL. http: //www.qatorlink.ufl.edu/ for more information. Ki, j Eai ,:r Ea, T. I h UF E-u.. e IQ Q t : -HQL h=Sl LdaEtZI Z. Hu i Iu pd | s L.
3. After logging in, users are given the option to start a new item and view all submitted items. partners, and the same underlying programming will also support "my bookshelf" style functionality for patrons. grant of permissions prohibits the Libraries from using the materials for commercial use or profit. and confidence level for preservation are explained in this table. The only current restrictions are on file size. and off-line use for an indefinite term. Off-line uses shall be consistent either, for educational uses, with the terms of U.S.
5. After granting permissions, the user is taken to a screen to provide information on the item to be submitted. item is submitted during the verification stage. customized template. All of the templates will be refined from user feedback. departmental affiliation does not display, but that data is retained and is shown in the record for the item. launch in Open Access week in October and after. 6. After describing the item, the user is brought to the upload page. You can now upload all related files for this item. Select browse to navigate to the file to upload and then upload the file. For assistance in choosing a file type to upload, please refer to our recommended file types. 8. After submitting the uploaded files, the user can then see a preview of the uploaded file display and the citation. The user can edit the citation information, which now displays more of the metadata fields. George A. S thers Download this PDF OBE READER"
SC1 X j 0 .F hLttp:,www.uflib.uf,.edu/dlglIalldevelopmentlPR.revie. tehtri. attribution, and customized landing pages to support contextual information for collections and materials. item on the following screens. 1 poster: 48 cm x 32 cm, b&w. 1 poster: b & w, 86 cm x 51 cm. "Jerry Uelsmann: Process & Perception"
1 poster col. 43 cm x 28 cm. center with the rules printed below. "Please Don't Feed the Gators"
21 cm x 28 cm. yellow, 28 cm x 21 cm. Father George Hagmaier, and Rev. M!fil^llia MllilBS M.i.i..l..B.m .. .
2 | Page 2. Users are directed to a login page to login with their Gatorlink accounts. This allows the IR to aut omatically pull their names, department and college affiliations, and contact information. 4 | Page 4. If the user chooses to start a new item, the user is brought to an agreement screen to grant permissions for the material to be shared online and archived. This grant of permissions allows the copyrig ht holder to retain all rights and simply allows the Libraries to post the item online for access and to archive it for preservation. The gran t of permissions prohibits the Libraries from using the materials for commercial use or profit. 5 | Page 5. After granting permissions, the user is taken to a screen to provide informatio n on the item to be submitted. For faculty ease, the metadata fields on this screen will be brief Additional metadata fields will show after the item is submitted during the verification stage. The metadata template underlying this page has been customized to support common faculty publication types (technical reports, journ al articles). This will be one of many templates, with the dLOC partners having another customized template. All of the templates will be re fined from user feedback. This screen is already pre on through Gat orlink). The departmental affiliation does not display, but that data is retained and is shown in the record for the item. Currently, only the primary departmental affiliation is collected, but that may be refined based on faculty preferences and feedback once the self submittal tool is released. We hope to collect a great deal of feedback that can be used to refine the tool from the initial soft launch in September and ongoing through the official launch in Open Access week in October and after. 6 | Page 6. After de scribing the item, the user is brought to the upload page. 7 | Page 7. The upload form allows the user to upload one or multiple files. Once the files are attached, they are shown on this page. 8 | Page 8. After submitting the uploaded files, the user can then see a preview of the uploaded file display and the citation. The user can edit the citation information, which now displays more of the metadata fields. 9 | Page Additional Services: Customized Interfaces and Guides The page below is the IR, simply customized to look like GatorScholar ( and it will be updated to reflect new GatorScholar interface once that interface is available ) The UFDC System allows for customized interfaces for branding, identity, and attribution, and customized landing pages to support co ntextual information for collections and materials. 2 | Page 2. Users are directed to a login page to login with their Gatorlink accounts. This allows the IR to automatically pull their names, department and college affiliations, and contact information. 3 | Page 3. After logging in, users are given the option to start a new item and view all submitted items. Later, the option to organize all materials into folders will be added. This will support IR users and dLOC partners, and the same underlying programming will also support my bookshelf style functionality for patrons. 4 | Page 4. If the user chooses to start a new item, the user is brought to an agreement screen to grant permissions for the material to be shared online and archived. This grant of permissions allows the copyright holder to retain all rights and simply allows the Libraries to post the item online for access and to archive it for preservation. The grant of permissions prohibits the Libraries from using the materials for commercial use or profit. 5 | Page 5. After granting permissions, the user is taken to a screen to provide information on the item to be submitted. For faculty ease, the metadata fields on this screen will be brief. Additional metadata fields will show after the item is submitted during the verification stage. The metadata template underlying this page has been customized to support common faculty publication types (technical reports, journal articles). This will be one of many templates, with the dLOC partners having another customized template. All of the templates will be refined from user feedback. This screen is already pre populated with the authors name (from the sign on through Gatorlink). The departmental affiliation does not display, but that data is retained and is shown in the record for the item. Currently, only the primary departmental affiliation is collected, but that may be refined based on faculty preferences and feedback once the self submittal tool is released. We hope to collect a great deal of feedback that can be used to refine the tool from the initial soft launch in September and ongoing through the official launch in Open Access week in October and after. 6 | Page 6. After describing the item, the user is brought to the upload page. 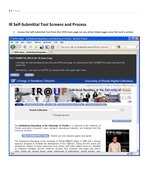 9 | Page Additional Services: Customized Interfaces and Guides The page below is the IR, simply customized to look like GatorScholar (and it will be updated to reflect new GatorScholar interface once that interface is available). The UFDC System allows for customized interfaces for branding, identity, and attribution, and customized landing pages to support contextual information for collections and materials.